Originally published under the title "SEPTA Ad Campaign a Spectacular Failure." The ad that began appearing on Philadelphia buses April 1 was no joke. The ad was sponsored by the American Freedom Defense Initiative (AFDI) and placed on buses of the Southeastern Pennsylvania Transportation Authority (SEPTA), a regional-and-state-run authority. 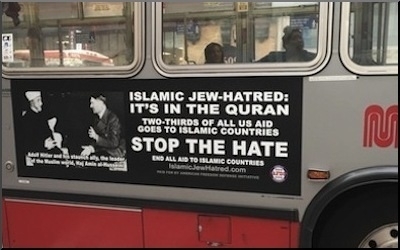 The ad read: "Islamic Jew-Hatred: It's in the Quran. Two thirds of all US aid goes to Islamic countries. Stop the hate. End all aid to Islamic countries. IslamicJewHatred.com." A November 1941 photograph ran with the caption, "Adolf Hitler and his staunch ally, the leader of the Muslim world, Haj Amin al-Husseini." SEPTA received $30,000 to run the 30-by-80 inch ad on 84 buses out of SEPTA's 1,400 buses during April. To begin with, the text is factually inaccurate. Amin al-Husseini was never "leader of the Muslim world." He was a British appointee in the Mandate for Palestine, where Muslims constituted less than 1 percent of the total world Muslim population. The ad failed spectacularly to achieve its goal of winning sympathy for Jewish victims of Muslims. But more important to the ad's failure was the hostile response it provoked. Rather than win support for Jews as victims of Muslims, it instead rallied the Philadelphia establishment to support Muslims as victims of Jews. A Jewish Exponent headline summed up the reaction: "Contempt for SEPTA Bus Ads Brings Groups Together." Mayor Michael Nutter convened an outdoor meeting under the city's famous LOVE sculpture that brought together activists, clergy, journalists, and intellectuals, where he denounced the "misguided and opportunistic political tactics" behind the bus ad. 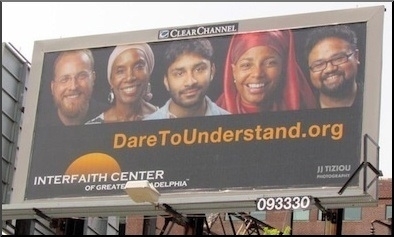 The Interfaith Center of Greater Philadelphia denounced the ad as "hurtful and bigoted," it reported that every group contacted was "horrified" by it, and posted a prominent billboard to counter it. The Interfaith Center of Greater Philadelphia posted a billboard to counter the bus ad. An interfaith group of leaders that included the city's Archbishop Charles Chaput condemned "inflammatory messages that serve to divide, stigmatize and incite prejudice." The ad also offered a platform for Muslim leaders to make statements like "for anyone to say that we hate Jews or anyone else of faith, doesn't know what they are talking about." Reform, Conservative, and Orthodox rabbis unloaded on the ad. One rabbi, Linda Holtzman, went further and led a campaign to deface the picture with stickers. The Anti-Defamation League called the ad "inflammatory and highly offensive." Even Israel's deputy consul general in Philadelphia, Elad Strohmayer, condemned the ad: "We shouldn't support any hatred towards any religious group ... and we should stand together as a community against that." The ad damaged the cause it meant to serve, while helping those it intended to harm. SEPTA itself strenuously objected to the ad, saying that it "put every single Muslim in the same category [of] being a Jew hater," and immediately changed its policy to reject all future political advertisements. Worse, SEPTA sent a long valentine to the Council on American-Islamic Relations (CAIR) – an Islamist organization outlawed as a terrorist group in the United Arab Emirates – commending CAIR's efforts "in negating the impact of the ads and fostering greater religious understanding and civil discourse." SEPTA also lauded "CAIR's message of inclusion and tolerance" and its stand "against these ads," thereby bestowing mountains of undeserved prestige on CAIR – while tacitly slamming those valiant Muslims fighting CAIR's oppressive ways. How might have the ad been more effectively composed? Simple: by distinguishing between the religion of Islam and the totalitarian ideology of Islamism, as in, "Radical Islam is the problem, moderate Islam is the solution. Non-Muslims and patriotic Muslims must band together to fight ISIS, Boku Haram, CAIR, and ISNA. Islamist-Watch.org" The picture might have featured novelist Salman Rushdie talking to television host Bill Maher, a liberal who criticizes radical Islam. Related Topics: Antisemitism, Muslims in the United States, US policy | Daniel Pipes receive the latest by email: subscribe to the free mef mailing list This text may be reposted or forwarded so long as it is presented as an integral whole with complete and accurate information provided about its author, date, place of publication, and original URL.